What kid doesn’t want to be a superhero? If that’s you now or if it was you when you were growing up, then SHAZAM! is a story you’ll be able to relate to. Billy Batson (Asher Angel, Disney Channel’s ANDI MACK) is a 14-year-old orphan who has bounced around foster homes in Philadelphia for most of his life. Sent to live with the highly ethnically and physically diverse Vasquez family, Billy befriends foster brother, Freddie Freeman (Jack Dylan Grazer, BEAUTIFUL BOY; IT), a disabled, self-professed superhero geek about his age. One day at school, after Billy defends Freddie from a pair of bullies, Billy takes off, ending up on one of the city’s subway trains. Suddenly, everything goes cosmic and the train’s doors open up to a mysterious cavern where he’s greeted by an old wizard (played by Djimon Hounsou, CAPTAIN MARVEL; KING ARTHUR, LEGEND OF THE SWORD; THE LEGEND OF TARZAN) who tells Billy that he was brought there because the boy, who is pure of heart and sort of able to resist temptation, has been chosen to receive the wizard’s powers. (At this point, the wizard is a bit desperate for a successor!) All he has to do to get them is hold onto the wizard’s staff and say the wizard’s name – Shazam. When he does, Billy transforms into a megabuff, 30-something, dressed in a red and gold superhero outfit complete with a Romanesque white cape. Billy (now played by Zachary Levi, THOR: RAGNAROK; TV’s CHUCK and THE MARVELOUS MRS. MAISEL) is still a teenager inside and he isn’t sure what do with his new superpowers. He’s not even sure what his new superpowers are but he and Freddie quickly figure them out after a series of tests that Freddie videorecords and uploads to the Internet. Just in time, too, as supervillain Dr. Thaddeus Sivana (Mark Strong, the KINGSMAN films), who embodies the Seven Deadly Sins, has decided to come after the city’s new superhero to try to steal away his powers. Helping the story along is the always amusing Levi, who plays the adult Billy with wide-eyed teenage naiveté. The superhero’s retro-tacky, ultra-muscly costume is an absolute riot and the actor uses he new-found superhero bulk to his advantage, striking bodybuilder poses and posing for selfies with his emerging fan club. Levi’s heavily lacquered hair also hearkens back to the character’s comic book image in the 1940s and even when he’s tossed around like a rag doll by Dr. Sivana, not a lock falls out of place. The two young actors who play Billy and Freddie are also great fun to watch. They have terrific on-screen chemistry together and it wouldn’t surprise me if they are pals off-screen too. Equally enjoyable is ten-year-old Faithe Herman, who plays their foster sister, Darla. She steals every scene she’s in. With all its comic-bookish special effects, SHAZAM does have a couple of wholesome messages to it – “family” and “deciding what kind of person you want to be”. Both seem very Spielberg-esque but they work here. 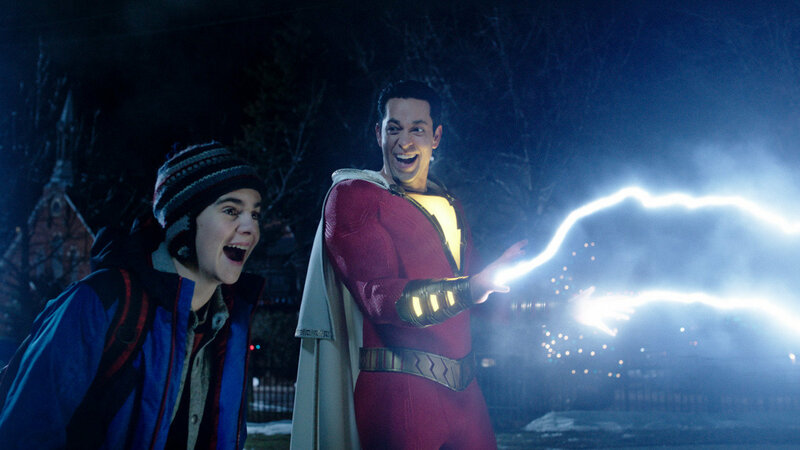 Shazam is a teenage boy who suddenly finds himself inside an adult’s body and has to grow up far sooner and faster than he would have liked – a theme that’s not all that different to the film, BIG, from 30-odd years ago. (Spielberg’s sister, Anne, co-wrote the screenplay to that film.) That similarity is not lost on the film’s writers either as one scene pays homage to the Tom Hanks comedy. Swedish filmmaker David F. Sandberg, best known for his horror films, ANNABELLE: CREATION and LIGHTS OUT, has scored a big win for the DC Extended Universe with this film. Get ready to see more adventures of Shazam in the future!